Groovy Goat was a hobby farm before it was a business. 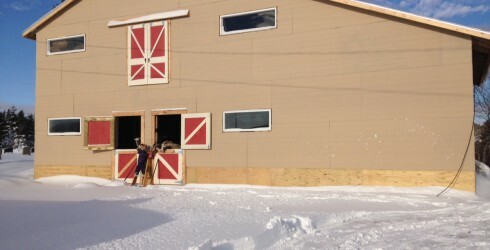 We built our barn one section at a time with what we could afford and it was never built properly. As our farm grew, our needs outgrew our barn and in November 2014 we started work on our new two story 24′ by 40′ barn. It was a learning curve for me, knowing a lot about electrical and enough about carpentry to get the job done. The barn was completed one long year later, with a concrete floor complete with drains, electrical, a hay loft and an unfurnished milking parlor. By winter 2016, our barn was done enough for the goats to move in. It is making our lives a lot easier and our groovy goats much happier. Please pop by for a visit if you’re around the Ingonish area. We will be offering barn/farm tours in the upcoming 2016 tourist season.